More funding cuts.... who is prepared to fight with me? When I started blogging 6 months ago, I had no idea the direction the blog would go in. I thought I would be posting a series of honest but witty stories about living with Autism that would encourage and inspire, and maybe increase understanding of what Autism is within the wider community. I don't really know if I've achieved that at all. What I do know is that I am now writing more and more often about funding and policy and battles for equal opportunities for my kids. The other stuff is still there, but more and more I find myself in the role of advocate and discontent. I really was not expecting that. It makes me think about how lucky people are who don't have to think about whether their child will be adequately supported at school. I was one of those until recently. Funding was available to support all my kids to learn well. L needed extra support and he got it. Thanks to "Every Student, Every School" that is now gone. I assumed G would get funding too, but as it turns out Government Policy changed, and now I have to fight for it. You might think that you are one of those who doesn't have to worry. I'm sorry to say that I am going to have to challenge that assumption. Our NSW Government has announced even more cuts to Education, and it is not just kids with disabilities they are targeting now. $1.7 billion is being taken, and your children will all be affected. As I predicted here, an outcry is starting. While I feel cranky that it took cuts that will affect the majority before people are interested in making a fuss, when my kids weren't worth fussing over, I am pleased that finally the campaign to let the government know we are not happy is building. Please keep an eye out for the NSW Teachers Federation organised protests that are coming up, and join in your closest demonstration. I for one will not be happy to sit back and watch, then tell my grandchildren that education used to be better, but we didn't bother to fight when they took away the funding. Are you? Who is prepared to fight with me? I have this weird thing going on with my eye at the moment. It's like a mix of allergy and conjunctivitis symptoms. It's pretty uncomfortable, but hardly life threatening. Yesterday I managed to have a little panic attack over it. Yep- I was sitting in the car with Hubby driving us, and all of a sudden I was overwhelmed with the worry that I had an infection in my brain that was so bad it was starting to seep out my eye and that I would die within days and Hubby would be left alone with the kids and he wouldn't know everything he needed to know to look after them. Now, none of my children has "severe" Autism. I don't have to worry about where they will live when I am gone, or who will look after them like some parents do. I thought that I was immune to these sort of panic attacks, to be honest. Apparently not. For the record, I have quite a good system for keeping records of all the important things Hubby would need if he suddenly had to become the primary care giver and organiser the way I am at the moment. Aside from the fact that he pretty much knows what is going on and attends as many meetings and therapy sessions as his work schedule allows, there is also a paper record of everything. Each of the kids has a file, in the filing drawers, that contains all their relevant health information, school records and for our ASD kids information about all the therapists who know them, recent reports..... everything. Hubby knows where these are, and could easily access everything he'd need to know. The rest of my filing is in all sorts of disarray, but this section is kept in immaculate order (I call it prioritising). I decided to take it as a prompt to think through the things I have in place for my kids to get their needs met, and to take a moment to evaluate my record keeping. I think my records are OK, and I am very fortunate to have family and friends that I know would be here for my Hubby and kids in less than a heartbeat if the need should arise. There is even a plan for if something happened to Hubby and I together. So I don't need to worry. And I won't. Because indulging in the endless cycle of "what ifs" is a time waster, an emotion waster, and an energy waster. And if really get started, I'll never stop ( I have a great imagination)! There are so many things to worry about, if you set your mind to it, and that is not what life should be about! Life should be about enjoying the little things, making time for laughs and contentment, celebrating what is good. Focusing on the attacks of the "what ifs" robs us of that, no matter who we are and what our challenges are. 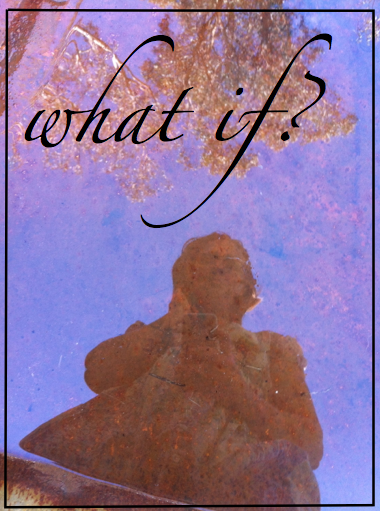 What are you going to do when the "what ifs" attack next? The Principal was surprised to be able to tell me that our application to be considered eligible to apply for individual funding had been approved. To be honest- I was surprised too. The form we filled in was not really set up to be easy to fill in with Autism in mind. It was much more geared toward physical disability, intellectual impairment or severe behaviour problem. The fact that we had to include the information that MissG is a flight risk when she experiences sensory overload may have helped our cause, I think. Whatever it was- they ticked the box that said we should go ahead and fill in the full application. So we did that one morning last week. The Principal, The School Counsellor, Wonderful Hubby and I sat down for almost 2 hours and tried to put into bureaucrat-speak everything important about looking after MissG's sensory, social and safety needs with the view to fitting some learning in there at the same time. The School Counsellor was a great help as he had completed some testing on MissG the week before and made some great observations about her reaction to stress, tiredness and being confronted with new situations and information (mainly that she tends to shut down and become unco-operative). We copied and pasted, and spat their own technical terms back at them. 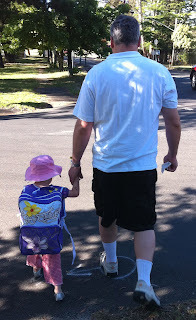 We were honest about how difficult she can be. That was hard. Hubby and I were debriefing afterward, and we both felt sad that we had to say such harsh things about our gorgeous girl to get them to pay attention to us. But we had to acknowledge that caring for her and keeping her safe is a tricky job, and to those who are not familiar with her it could be quite overwhelming, especially while she is adjusting to a new school with all it's different routines, structures, people and other variables. So, honest we were, as painful as it felt, because we want the school to be well resourced. In some ways it was a bit validating to have to explain to someone all the things we know and just automatically do. I know that sounds a bit strange, but in a way it is good to verbalise what our normal is and acknowledge that it is intense and busy and difficult. It is good to be able to realise that all things considered, we are doing an OK job, too! Anyway, we filled in as much as we could. There were a couple of things I had to give copies of to the school (like MissG's letter of diagnosis from the Paediatrician) so they could keep the box tickers happy. And now we wait again. We wait to see if the powers that be who don't know our child at all want to assign a dollar amount to how difficult she will be to have in school. If they do- how much will it be? It is an uncomfortable wait. But wait we must.